Question: "How does one become a Reader, and what does a Reader do?" "My son, the first degree in the Priesthood is that of Reader. It behooveth thee therefore to peruse the divine Scriptures daily, to the end that the hearers, regarding thee may receive edification; that thou in nowise shaming thine election, mayest prepare thyself for a higher degree. For by a chaste, holy and upright life thou shalt gain the favor of the God of loving-kindness, and shalt render thyself worthy of a greater ministry, through Jesus Christ our Lord: to whom be glory unto the ages of ages. Amen." This tells us that the office of the Reader is the first rank of the priesthood. There are two types of clergy: minor clergy, and major clergy. Readers are tonsured, which means that rather than being ordained in the Altar, they are set apart by having some of their hair cut in the form of the Cross (as also happens at baptism, and when someone is made a monastic) and ordained in the Nave of the Church, as are Subdeacons, who are also minor clergy. The major clergy are Bishops, Priest, and Deacons. But what it means for this to be the first rank of the priesthood is that the same basic requirements to be ordained a Priest are also required of a Reader. A reader must of course be Orthodox. He must also be a man who has not been married more than once. He must be of a good reputation. 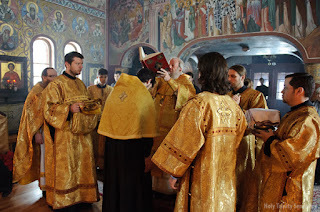 There are other possible impediments to ordination, and most of them apply equally to readers (there are different age requirements for deacons, priests, and bishops, and bishops are required to be monastics). A Reader should also read the Scriptures daily, and be familiar enough with the texts that he reads that those who hear him are able to understand him, and be edified by his reading. In addition to that, a Reader should learn the rubrics of the services, and should learn to sing his way through the services by learning the tones, and how to use and combine the liturgical texts at the kliros. In most parishes, there are choir directors who do most of that work at the main services, but a Reader should learn this as well, so that if he is the only person at the kliros (as can happen at some of the daily services) he will be able to read and sing all of the parts of the services that are not specific to the Bishop, Priest, and Deacon. The admonition to the Reader that he "in nowise" shame his election means that he should be an example to others in the Church. As St. Paul admonished St. Timothy: "be thou an example of the believers, in word, in conduct, in charity, in spirit, in faith, in purity" (1 Timothy 4:12). And a reader should do this in order to prepare himself "for a higher degree." In other words, a reader should be preparing himself for the possibility of serving in a higher rank of the clergy. Of course all Christians should try to be an example "in word, in conduct, in charity, in spirit, in faith, in purity," but this should be especially the case for clergy. This means a Reader should be personally pious, loving towards others, and should love the services of the Church. Anyone who is able (and of course an Orthodox Christian) can serve the function of a Reader, when needed. And there are many people who are not tonsured as Readers who do. However, one who actually is a Reader has a duty to fill this role, and so should be zealous to prepare himself to fulfill this role, and should be eager to actually do it, being present whenever possible for the services, and making themselves available to do their duty. If someone is interested in becoming a reader, they should speak to the priest and begin applying themselves to learning how to properly do it. Even if they are not eventually tonsured as a Reader, the knowledge they acquire is beneficial to any Orthodox Christian. For more on what it means to be a Reader, I would recommend reading Instruction for the Church Reader as well as A Guide for Readers in the Orthodox Church, by Fr. Geoffrey Korz.